For other large prehistoric reptiles (or birds), see Largest prehistoric animals § Reptiles (Reptilia). Size has been one of the most interesting aspects of dinosaur science to the general public and to scientists. Dinosaurs show some of the most extreme variations in size of any land animal group, ranging from the tiny hummingbirds, which can weigh as little as three grams, to the extinct titanosaurs, which could weigh as much as 90 tonnes (89 long tons; 99 short tons). Scientists will probably never be certain of the largest and smallest dinosaurs to have ever existed. This is because only a tiny percentage of animals ever fossilize, and most of these remain buried in the earth. Few of the specimens that are recovered are complete skeletons, and impressions of skin and other soft tissues are rare. Rebuilding a complete skeleton by comparing the size and morphology of bones to those of similar, better-known species is an inexact art, and reconstructing the muscles and other organs of the living animal is, at best, a process of educated guesswork. Weight estimates for dinosaurs are much more variable than length estimates, because estimating length for extinct animals is much more easily done from a skeleton than estimating weight. Estimating weight is most easily done with the laser scan skeleton technique that puts a "virtual" skin over it, but even this is only an estimate. Current evidence suggests that dinosaur average size varied through the Triassic, early Jurassic, late Jurassic and Cretaceous periods. Predatory theropod dinosaurs, which occupied most terrestrial carnivore niches during the Mesozoic, most often fall into the 100- to 1,000-kilogram (220 to 2,200 lb) category when sorted by estimated weight into categories based on order of magnitude, whereas recent predatory carnivoran mammals peak in the 10- to 100-kilogram (22 to 220 lb) category. The mode of Mesozoic dinosaur body masses is between one and ten metric tonnes. This contrasts sharply with the size of Cenozoic mammals, estimated by the National Museum of Natural History as about 2 to 5 kg (4.4 to 11.0 lb). The sauropods were the largest and heaviest dinosaurs. For much of the dinosaur era, the smallest sauropods were larger than anything else in their habitat, and the largest were an order of magnitude more massive than anything else that has since walked the Earth. Giant prehistoric mammals such as Paraceratherium and Palaeoloxodon (the largest land mammals ever) were dwarfed by the giant sauropods, and only modern whales surpass them in size. There are several proposed advantages for the large size of sauropods, including protection from predation, reduction of energy use, and longevity, but it may be that the most important advantage was dietary. Large animals are more efficient at digestion than small animals, because food spends more time in their digestive systems. This also permits them to subsist on food with lower nutritive value than smaller animals. Sauropod remains are mostly found in rock formations interpreted as dry or seasonally dry, and the ability to eat large quantities of low-nutrient browse would have been advantageous in such environments. One of the tallest and heaviest dinosaurs known from good skeletons is Giraffatitan brancai (previously classified as a species of Brachiosaurus). Its remains were discovered in Tanzania between 1907 and 1912. 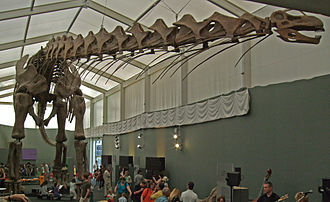 Bones from several similar-sized individuals were incorporated into the skeleton now mounted and on display at the Museum für Naturkunde Berlin; this mount is 12–13.27 metres (39.4–43.5 ft) tall and 21.8–22.5 metres (72–74 ft) long, and would have belonged to an animal that weighed between 30,000 to 60,000 kilograms (66,000 to 132,000 lb). One of the longest complete dinosaurs is the 27-metre-long (89 ft) Diplodocus, which was discovered in Wyoming in the United States and displayed in Pittsburgh's Carnegie Natural History Museum in 1907. There were larger dinosaurs, but knowledge of them is based entirely on a small number of fragmentary fossils. Most of the largest herbivorous specimens on record were discovered in the 1970s or later, and include the massive titanosaur Argentinosaurus huinculensis, which is the largest dinosaur known from uncontroversial evidence, estimated to have been 50–96.4 metric tons (55.1–106.3 short tons) and 30–39.7 m (98–130 ft) long. Some of the longest sauropods were those with exceptionally long, whip-like tails, such as the 29–33.5-metre-long (95–110 ft) Diplodocus hallorum (formerly Seismosaurus) and the 33- to 35-metre-long (108–115 ft) Supersaurus. In 2014, the fossilized remains of a previously unknown species of sauropod were discovered in Argentina. The titanosaur, named Patagotitan mayorum, would have been around 40m long and weighed around 77 tonnes, larger than any other previously found sauropod. The specimens found were remarkably complete, significantly more so than previous titanosaurs. Research as of 2017 estimated Patagotitan to have been 37 m (121 ft) long  It has also been suggested that Patagotitan is not necessarily larger than Argentinosaurus and Puertasaurus. Skeleton of Giganotosaurus, one of the largest theropods known. Tyrannosaurus was for many decades the largest theropod and best-known to the general public. 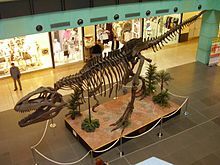 Since its discovery, however, a number of other giant carnivorous dinosaurs have been described, including Spinosaurus, Carcharodontosaurus, and Giganotosaurus. These large theropod dinosaurs rivaled or even exceeded Tyrannosaurus in size, though more recent studies show some indication that Tyrannosaurus, although shorter, was the heavier predator. There is still no clear explanation for exactly why these animals grew so much larger than the land predators that came before and after them. The largest extant theropod is the common ostrich, up to 2.74 metres (9 ft 0 in) tall and weighs between 63.5 and 145.15 kilograms (140.0 and 320.0 lb). The smallest non-avialan theropod known from adult specimens may be Anchiornis huxleyi, at 110 grams (3.9 ounces) in weight and 34 centimetres (13 in) in length. However, some studies suggest that Anchiornis was actually an avialan. The smallest dinosaur known from adult specimens which is definitely not an avialan is Parvicursor remotus, at 162 grams (5.7 oz) and measuring 39 centimetres (15 in) long. When modern birds are included, the bee hummingbird Mellisuga helenae is smallest at 1.9 g (0.067 oz) and 5.5 cm (2.2 in) long. Recent theories propose that theropod body size shrank continuously over the past 50 million years, from an average of 163 kilograms (359 lb) down to 0.8 kg (1.8 lb), as they eventually evolved into modern birds. This is based on evidence that theropods were the only dinosaurs to get continuously smaller, and that their skeletons changed four times faster than those of other dinosaur species. Sauropodomorph size is difficult to estimate given their usually fragmentary state of preservation. Sauropods are often preserved without their tails, so the margin of error in overall length estimates is high. Mass is calculated using the cube of the length, so for species in which the length is particularly uncertain, the weight is even more so. Estimates that are particularly uncertain (due to very fragmentary or lost material) are preceded by a question mark. Each number represents the highest estimate of a given research paper. One large sauropod, Maraapunisaurus fragillimus, was based on particularly scant remains that have been lost since their description by paleontologists in 1878. Analysis of the illustrations included in the original report suggested that M. fragillimus may have been the largest land animal of all time, weighing up to 100–150 t (110–170 short tons) and measuring between 40–60 m (130–200 ft) long. One later analysis of the surviving evidence, and the biological plausibility of such a large land animal, suggested that the enormous size of this animal was an over-estimate due partly to typographical errors in the original report. This would later be challenged by a different study, which argued Cope's measurements were genuine and there's no basis for assuming typographical errors. The study, however, also reclassified the species and correspondingly gave a much lower length estimate of 30.3 metres (99 ft). Generally, the giant sauropods can be divided into two categories: the shorter but stockier and more massive forms (mainly titanosaurs and some brachiosaurids), and the longer but slenderer and more light-weight forms (mainly diplodocids). Because different methods of estimation sometimes give conflicting results, mass estimates for sauropods can vary widely causing disagreement among scientists over the accurate number. For example, the titanosaur Dreadnoughtus was originally estimated to weigh 59.3 tonnes by the allometric scaling of limb-bone proportions, whereas more recent estimates, based on three-dimensional reconstructions, yield a much smaller figure of 22.1–38.2 tonnes. Eoraptor compared in size to a human. Leyesaurus marayensis: 2.1 m (6.9 ft)? Sizes are given with a range, where possible, of estimates that have not been contradicted by more recent studies. In cases where a range of currently accepted estimates exist, sources are given for the sources with the lowest and highest estimates, respectively, and only the highest values are given if these individual sources give a range of estimates. Some other giant theropods are also known; for example, a theropod trackmaker in Morocco that was perhaps between 10 and 19 metres (33 and 62 ft) long, but the information is too scarce to make precise size estimates. Chilantaisaurus tashuikouensis: 11–13 m (36–43 ft)? Palaeopteryx thompsoni: 30 cm (12 in)? Hypsibema crassicauda: 15 m (49 ft)? Hypsibema missouriensis (Parrosaurus): 15 m (49 ft)? Ornithotarsus immanis: 12 m (39 ft)? Size of Triceratops prorsus (orange) and T. horridus (green) compared to a human. Size by overall length, including tail, of all pachycephalosaurs measuring 3 metres (9.8 ft) or more in length. Gravitholus albertae: 3 m (9.8 ft)? Size by overall length, including tail, of all pachycephalosaurs measuring 2 metres (6 ft 7 in) or less in length as adults. Dyoplosaurus acutosquameus: 7 m (23 ft)? ^ Rensberger, J. M.; Martínez, R. N. (2015). "Bone Cells in Birds Show Exceptional Surface Area, a Characteristic Tracing Back to Saurischian Dinosaurs of the Late Triassic". PLoS ONE. 10 (4): e0119083. Bibcode:2015PLoSO..1019083R. doi:10.1371/journal.pone.0119083. PMC 4382344. PMID 25830561. ^ Sereno PC (1999). "The evolution of dinosaurs". Science. 284 (5423): 2137–2147. doi:10.1126/science.284.5423.2137. PMID 10381873. ^ Farlow JA (1993). "On the rareness of big, fierce animals: speculations about the body sizes, population densities, and geographic ranges of predatory mammals and large, carnivorous dinosaurs". In Dodson, Peter; Gingerich, Philip (eds.). Functional Morphology and Evolution. American Journal of Science, Special Volume. 293-A. pp. 167–199. ^ Peczkis, J. (1994). "Implications of body-mass estimates for dinosaurs". Journal of Vertebrate Paleontology. 14 (4): 520–33. doi:10.1080/02724634.1995.10011575. ^ a b c d e f Carpenter, K. (2006). "Biggest of the big: a critical re-evaluation of the mega-sauropod Amphicoelias fragillimus." In Foster, J.R. and Lucas, S.G., eds., 2006, Paleontology and Geology of the Upper Jurassic Morrison Formation. New Mexico Museum of Natural History and Science Bulletin 36: 131–138. ^ "The World of Dinosaurs". Museum für Naturkunde. Retrieved 2018-11-16. ^ a b c d e González Riga, Bernardo J.; Lamanna, Matthew C.; Ortiz David, Leonardo D.; Calvo, Jorge O.; Coria, Juan P. (2016). "A gigantic new dinosaur from Argentina and the evolution of the sauropod hind foot". Scientific Reports. 6: 19165. Bibcode:2016NatSR...619165G. doi:10.1038/srep19165. PMC 4725985. PMID 26777391. ^ a b Sellers, W. I.; Margetts, L.; Coria, R. A. B.; Manning, P. L. (2013). Carrier, David (ed.). "March of the Titans: The Locomotor Capabilities of Sauropod Dinosaurs". PLoS ONE. 8 (10): e78733. Bibcode:2013PLoSO...878733S. doi:10.1371/journal.pone.0078733. PMC 3864407. PMID 24348896. ^ a b c d e f g h i j k l m n o p q r s t u v w x y z aa ab ac ad ae af ag ah ai aj ak al am an ao ap aq ar as at au av aw ax ay az ba bb bc bd be bf bg bh bi bj bk bl bm bn bo bp bq br bs bt bu bv bw bx by bz ca cb cc cd ce cf cg ch ci cj ck cl cm cn co cp cq cr cs ct cu cv cw cx cy cz da db dc dd de df dg dh di dj dk dl dm dn do dp dq dr ds dt du dv dw dx dy dz ea eb ec ed ee ef eg eh ei ej ek el em en eo Paul, Gregory S. (2016). The Princeton Field Guide to Dinosaurs 2nd Edition. United States of America: Princeton University Press. pp. 70–348. ISBN 978-0-691-16766-4. ^ a b c Lovelace, David M.; Hartman, Scott A.; Wahl, William R. (2007). "Morphology of a specimen of Supersaurus (Dinosauria, Sauropoda) from the Morrison Formation of Wyoming, and a re-evaluation of diplodocid phylogeny". Arquivos do Museu Nacional. 65 (4): 527–544. ^ Morgan, James (2014-05-17). "'Biggest dinosaur ever' discovered". BBC News. Retrieved 2017-03-21. ^ "Don't believe the hype: Patagotitan was not bigger than Argentinosaurus". Sauropod Vertebra Picture of the Week. 2017-08-09. Retrieved 2019-02-19. ^ a b c Therrien, F.; Henderson, D. M. (2007). "My theropod is bigger than yours...or not: estimating body size from skull length in theropods". Journal of Vertebrate Paleontology. 27 (1): 108–115. doi:10.1671/0272-4634(2007)27[108:MTIBTY]2.0.CO;2. ^ "See what African Wildlife Foundation is doing to protect these iconic flightless birds". 2013-02-25. ^ Xu, X., Zhao, Q., Norell, M., Sullivan, C., Hone, D., Erickson, G., Wang, X., Han, F. and Guo, Y. (2009). "A new feathered maniraptoran dinosaur fossil that fills a morphological gap in avian origin." Chinese Science Bulletin, 6 pages, accepted November 15, 2008. ^ a b c Which was the smallest dinosaur? Archived July 6, 2011, at the Wayback Machine Royal Tyrrell Museum. Last accessed 2008-05-23. ^ Borenstein, Seth (July 31, 2014). "Study traces dinosaur evolution into early birds". AP News. Archived from the original on August 8, 2014. Retrieved August 3, 2014. ^ Zoe Gough (31 July 2014). "Dinosaurs 'shrank' regularly to become birds". BBC. ^ a b c d e Paul, Gregory S. (1997). "Dinosaur models: the good, the bad, and using them to estimate the mass of dinosaurs". Dinofest International 1997: 129–154. ^ Woodruff, C; Foster, JR (2015). "The fragile legacy of Amphicoelias fragillimus (Dinosauria: Sauropoda; Morrison Formation - Latest Jurassic)". PeerJ PrePrints. doi:10.7287/peerj.preprints.838v1. ^ Carpenter, Kenneth (2018). "Maraapunisaurus fragillimus, N.G. (formerly Amphicoelias fragillimus), a basal Rebbachisaurid from the Morrison Formation (Upper Jurassic) of Colorado". Geology of the Intermountain West. 5: 227–244. doi:10.31711/giw.v5i0.28. ^ a b Bates, Karl T.; Falkingham, Peter L.; Macaulay, Sophie; Brassey, Charlotte; Maidment, Susannah C.R. (2015). "Downsizing a giant: re-evaluating Dreadnoughtus body mass". Biol Lett. 11 (6): 20150215. doi:10.1098/rsbl.2015.0215. PMC 4528471. PMID 26063751. ^ a b c d e f g h i j k l m n o p q r s t u v w x y z aa ab ac ad ae af ag ah ai aj ak al am an ao ap aq ar as at au av aw ax ay az ba bb Benson, RBJ; Campione, NE; Carrano, MT; Mannion, PD; Sullivan, C; Evans, DC; et al. (2014). "Rates of Dinosaur Body Mass Evolution Indicate 170 Million Years of Sustained Ecological Innovation on the Avian Stem Lineage". PLoS Biol. 12 (5): e1001853. doi:10.1371/journal.pbio.1001853. PMC 4011683. PMID 24802911. ^ José L. Carballido; Diego Pol; Alejandro Otero; Ignacio A. Cerda; Leonardo Salgado ; Alberto C. Garrido ; Jahandar Ramezani ; Néstor R. Cúneo ; Javier M. Krause (2017). "A new giant titanosaur sheds light on body mass evolution among sauropod dinosaurs". Proceedings of the Royal Society B: Biological Sciences. 284 (1860): 20171219. doi:10.1098/rspb.2017.1219. ^ a b Mazzetta, Gerardo V.; Christiansen, Per; Fariña, Richard A. (2004). "Giants and Bizarres: Body Size of Some Southern South American Cretaceous Dinosaurs" (PDF). Historical Biology. 16 (2–4): 71–83. CiteSeerX 10.1.1.694.1650. doi:10.1080/08912960410001715132. Retrieved 2008-01-08. ^ Wedel, M. 2013. A giant, skeletally immature individual of Apatosaurus from the Morrison Formation of Oklahoma. The Annual Symposium of Vertebrate Palaeontology and Comparative Anatomy 2013:45. ^ a b Wedel, Mathew J.; Cifelli, R.L. ; Sanders, R..K. (2000). "Osteology, paleobiology, and relationships of the sauropod dinosaur Sauroposeidon" (PDF). Acta Palaeontologica Polonica. 45: 343–388. ^ a b Wedel, Mathew J.; Cifelli, Richard L. (Summer 2005). "Sauroposeidon: Oklahoma's Native Giant" (PDF). Oklahoma Geology Notes. 65 (2): 40–57. Archived from the original (PDF) on 2008-09-20. ^ Burness, G.P. ; Flannery, T.; Flannery, T (2001). "Dinosaurs, dragons, and dwarfs: The evolution of maximal body size". Proceedings of the National Academy of Sciences. 98 (25): 14518–14523. Bibcode:2001PNAS...9814518B. doi:10.1073/pnas.251548698. PMC 64714. PMID 11724953. ^ Yong, Ed (18 May 2014). "Biggest Dinosaur Ever? Maybe. Maybe Not. – Phenomena". BMC Biology. 10: 60. doi:10.1186/1741-7007-10-60. PMC 3403949. PMID 22781121. Retrieved 11 June 2016. ^ a b Jianu, Coralia-Maria; Weishampel, David B. (1999). "The smallest of the largest: a new look at possible dwarfing in sauropod dinosaurs". Geologie en Mijinbouw. 78. ^ a b c d e f g h i j k l m n o p q r s t u v w x y z aa ab ac ad ae af ag ah ai aj ak al am an ao ap aq ar as at au av aw ax ay az ba bb bc bd be bf bg bh bi bj bk bl bm bn bo bp bq br Holtz, Thomas R., Jr.; Rey, Luis V. (2007). Dinosaurs: the most complete, up-to-date encyclopedia for dinosaur lovers of all ages (PDF). New York: Random House. ISBN 978-0-375-82419-7. ^ Herne, Matthew C.; Lucas, Spencer G. (2006). "Seismosaurus hallorum: Osteological reconstruction from the holotype". New Mexico Museum of Natural History and Science Bulletin. 36. ^ Russell, Dale A.; Zheng, Zhong (1993). "A large mamenchisaurid from the Junggar Basin, Xinjiang, People's Republic of China". Canadian Journal of Earth Sciences. 30 (10): 2082–2095. Bibcode:1993CaJES..30.2082R. doi:10.1139/e93-180. ^ Wu, Wen-hao; Zhou, Chang-Fu; Wings, Oliver; Toru, Sekiya; Dong, Zhi-ming (2013). "A new gigantic sauropod dinosaur from the Middle Jurassic of Shanshan, Xinjiang" (PDF). Global Geology. 32 (3): 437–446. doi:10.3969/j.issn.1004-5589.2013.03.002. ^ a b Stein, K.; Csiki, Z.; Curry Rogers, K.; Weishampel, D.B. ; Redelstorff, R.; Carballidoa, J.L. ; Sandera, P.M. (2010). "Small body size and extreme cortical bone remodeling indicate phyletic dwarfism in Magyarosaurus dacus (Sauropoda: Titanosauria)" (PDF). Proceedings of the National Academy of Sciences of the United States of America. 20. 107 (20): 9258–9263. Bibcode:2010PNAS..107.9258S. doi:10.1073/pnas.1000781107. PMC 2889090. PMID 20435913. ^ Buffetaut, E.; Suteethorn, V.; Cuny, G.; Tong, H.; Le Loeuff, J.; Khansubha, S.; Jongautchariyakul, S. (2000). "The earliest known sauropod dinosaur". Nature. 407 (6800): 72–74. Bibcode:2000Natur.407...72B. doi:10.1038/35024060. PMID 10993074. ^ Henderson, Donald (2013). "Sauropod Necks: Are They Really for Heat Loss?". PLoS ONE. 8 (10): e77108. Bibcode:2013PLoSO...877108H. doi:10.1371/journal.pone.0077108. PMC 3812985. PMID 24204747. ^ Yates, A.M.; Kitching, J.W. (2003). "The earliest known sauropod dinosaur and the first steps towards sauropod locomotion". Proceedings of the Royal Society of London B: Biological Sciences. 270 (1525): 1753–1758. doi:10.1098/rspb.2003.2417. PMC 1691423. PMID 12965005. ^ "Rastrilladas de icnitas terópodas gigantes del Jurásico Superior (Sinclinal de Iouaridène, Marruecos)". ^ Boutakiout, Mohamed; Hadri, Majid; Nouri, Jaouad; Diaz-Martinez, Ignacio; Perez-Lorente, Felix (2009). "Rastrilladas de icnitas teropodas gigantes del JuraSico superior (sinclinal de Iouaridene, Marruecos)". Revista Española de Paleontología. 24 (1): 31–46. ^ a b c d Therrien, F.; Henderson, D.M. (2007). "My theropod is bigger than yours...or not: estimating body size from skull length in theropods". Journal of Vertebrate Paleontology. 27 (1): 108–115. doi:10.1671/0272-4634(2007)27[108:MTIBTY]2.0.CO;2. ISSN 0272-4634. ^ Glut, D.F. (1982). The New Dinosaur Dictionary. Secaucus, NJ: Citadel Press. pp. 226–228. ISBN 978-0-8065-0782-8. ^ a b c d e f g h i j k l m n o p q r s Seebacher, F. (2001). "A new method to calculate allometric length-mass relationships of dinosaurs". Journal of Vertebrate Paleontology. 21 (1): 51–60. CiteSeerX 10.1.1.462.255. doi:10.1671/0272-4634(2001)021[0051:ANMTCA]2.0.CO;2. ISSN 0272-4634. ^ Currie, Philip J.; Carpenter, Kenneth (2000). "A new specimen of Acrocanthosaurus atokensis (Theropoda, Dinosauria) from the Lower Cretaceous Antlers Formation (Lower Cretaceous, Aptian) of Oklahoma, USA". Geodiversitas. 22 (2): 207–246. Archived from the original on 2007-11-14. ^ Lee, Yuong-Nam; Barsbold, Rinchen; Currie, Philip J.; Kobayashi, Yoshitsugu; Lee, Hang-Jae; Godefroit, Pascal; Escuillié, François; Chinzorig, Tsogtbaatar (2014) [22 October 2014]. "Resolving the long-standing enigmas of a giant ornithomimosaur Deinocheirus mirificus". Nature. 515 (7526): 257–260. Bibcode:2014Natur.515..257L. doi:10.1038/nature13874. PMID 25337880. ^ Benson R.B.J. ; Carrano M.T; Brusatte S.L. (2010). "A new clade of archaic large-bodied predatory dinosaurs (Theropoda: Allosauroidea) that survived to the latest Mesozoic". Naturwissenschaften. 97 (1): 71–78. Bibcode:2010NW.....97...71B. doi:10.1007/s00114-009-0614-x. PMID 19826771. ^ Coria, R. A.; Currie, P. J. (2006). "A new carcharodontosaurid (Dinosauria, Theropoda) from the Upper Cretaceous of Argentina" (PDF). Geodiversitas. 28 (1): 71–118. ISSN 1280-9659. Archived from the original (PDF) on 2009-03-26. ^ Chure, Daniel J. (1995). "A reassessment of the gigantic theropod Saurophagus maximus from the Morrison Formation (Upper Jurassic) of Oklahoma, USA". In A. Sun; Y. Wang (eds.). Sixth Symposium on Mesozoic Terrestrial Ecosystems and Biota, Short Papers. Beijing: China Ocean Press. pp. 103–106. ^ Coria, R. A.; Currie, P. J. (2006). "A new carcharodontosaurid (Dinosauria, Theropoda) from the Upper Cretaceous of Argentina". Geodiversitas. 28 (1): 71–118. CiteSeerX 10.1.1.624.2450. ISSN 1280-9659. ^ Suarez, R. K. (1992). "Hummingbird flight: sustaining the highest mass-specific metabolic rates among vertebrates". Experientia. 48 (6): 565–570. doi:10.1007/bf01920240. PMID 1612136. ^ a b Steven Latta; Christopher Rimmer; Allan Keith; James Wiley; Herbert Raffaele; Kent McFarland; Eladio Fernandez (15 May 2010). Birds of the Dominican Republic and Haiti. Princeton University Press. pp. 135–. ISBN 978-0-691-11891-8. Retrieved 23 August 2012. ^ a b "Rufous Hummingbird" All about birds Cornell Lab of Ornithology. ^ a b c d CRC Handbook of Avian Body Masses by John B. Dunning Jr. (Editor). CRC Press (1992), ISBN 978-0-8493-4258-5. ^ a b Arizmendi, M.C. ; Rodríguez-Flores, C.; Soberanes-González, C. (2010). Schulenberg, T.S., ed. "Short-crested Coquette (Lophornis brachylophus)" Neotropical Birds Online. Ithaca: Cornell Lab of Ornithology. ^ a b Powers, D. R. (1991). Diurnal variation in mass, metabolic rate, and respiratory quotient in Anna's and Costa's hummingbirds. Physiological Zoology, 850-870. ^ "NZ Birds Online". Retrieved 2 March 2015. ^ "Te Ara: The Encyclopedia of New Zealand". Retrieved 2 March 2015. ^ Gray, G. R (1844). "Gerygone albofrontata". Zoology of the Voyage of H.M.S Erebus and Terror: 5. Retrieved 3 March 2015. ^ "Bananaquits". birdingguide.com. Archived from the original on 18 November 2011. Retrieved 21 October 2011. ^ Fjeldså, J.; Krabbe, N. (1990). Birds of the High Andes: A Manual to the Birds of the Temperate Zone of the Andes and Patagonia, South America. Zoological Museum, University of Copenhagen. p. 297. ISBN 9788788757163. Retrieved 13 April 2015. ^ Schulenberg, T.S. ; Stotz, D.F. ; Lane, D.F. ; O'Neill, J.P.; Parker, T.A. ; Egg, A.B. (2010). Birds of Peru: Revised and Updated Edition. Princeton University Press. p. 250. ISBN 9781400834495. Retrieved 13 April 2015. ^ Naish, D.; Sweetman, S.C. (2011). "A tiny maniraptoran dinosaur in the Lower Cretaceous Hastings Group: evidence from a new vertebrate-bearing locality in south-east England". Cretaceous Research. 32 (4): 464–471. doi:10.1016/j.cretres.2011.03.001. ^ a b Zhang, F.; Zhou, Z.; Xu, X.; Wang, X.; Sullivan, C. (2008). "A bizarre Jurassic maniraptoran from China with elongate ribbon-like feathers". Nature (Submitted manuscript). 455 (7216): 1105–8. Bibcode:2008Natur.455.1105Z. doi:10.1038/nature07447. PMID 18948955. ^ Xu, Xing; Qin, Zi-Chuan (2017). "A new tiny dromaeosaurid dinosaur from the Lower Cretaceous Jehol Group of western Liaoning and niche differentiation among the Jehol dromaeosaurids" (PDF). Vertebrata PalAsiatica. In press. Archived from the original (PDF) on 2017-04-13. Retrieved 2017-04-13. ^ Zhao, X.; Li, D.; Han, G.; Hao, H.; Liu, F.; Li, L.; Fang, X. (2007). "Zhuchengosaurus maximus from Shandong Province". Acta Geoscientia Sinica. 28 (2): 111–122. doi:10.1007/s10114-005-0808-x. ^ Zhao Xijin; Wang Kebai; Li Dunjing (2011). "Huaxiaosaurus aigahtens". Geological Bulletin of China. 30 (11): 1671–1688. ^ Glut, Donald F. (1997). "Shantungosaurus". Dinosaurs: The Encyclopedia. Jefferson, North Carolina: McFarland & Co. pp. 816–817. ISBN 978-0-89950-917-4. ^ Sues, Hans-Dieter (1997). "ornithopods". In James Orville Farlow; M. K. Brett-Surman (eds.). The Complete Dinosaur. Bloomington: Indiana University Press. p. 338. ISBN 978-0-253-33349-0. ^ Naish, Darren; David M. Martill (2001). "Ornithopod dinosaurs". Dinosaurs of the Isle of Wight. London: The Palaeontological Association. pp. 60–132. ISBN 978-0-901702-72-2. ^ Dixon, Dougal (2006). The Complete Book of Dinosaurs. London: Anness Publishing Ltd. p. 216. ISBN 978-0-681-37578-9. ^ Glut, Donald F. (1997). "Edmontosaurus". Dinosaurs: The Encyclopedia. Jefferson, North Carolina: McFarland & Co. pp. 389–396. ISBN 978-0-89950-917-4. ^ Lambert, David; the Diagram Group (1990). The Dinosaur Data Book. New York: Avon Books. p. 60. ISBN 978-0-380-75896-8. ^ Prieto-Márquez, A.; Chiappe, L. M.; Joshi, S. H. (2012). Dodson, Peter (ed.). "The lambeosaurine dinosaur Magnapaulia laticaudus from the Late Cretaceous of Baja California, Northwestern Mexico". PLoS ONE. 7 (6): e38207. Bibcode:2012PLoSO...738207P. doi:10.1371/journal.pone.0038207. PMC 3373519. PMID 22719869. ^ Glut, Donald F. (1997). "Saurolophus". Dinosaurs: The Encyclopedia. Jefferson, North Carolina: McFarland & Co. pp. 788–789. ISBN 978-0-89950-917-4. ^ a b Horner, John R.; Weishampel, David B.; Forster, Catherine A (2004). "Hadrosauridae". In Weishampel, David B.; Dodson, Peter; Osmólska, Halszka (eds.). The Dinosauria (2nd ed.). Berkeley: University of California Press. pp. 438–463. ISBN 978-0-520-24209-8. ^ Glut, Donald F. (1997). "Anatotitan". Dinosaurs: The Encyclopedia. Jefferson, North Carolina: McFarland & Co. pp. 132–134. ISBN 978-0-89950-917-4. ^ Glut, Donald F. (1997). "Iguanodon". Dinosaurs: The Encyclopedia. Jefferson, North Carolina: McFarland & Co. pp. 490–500. ISBN 978-0-89950-917-4. ^ Glut, Donald F. (1997). "Parasaurolophus". Dinosaurs: The Encyclopedia. Jefferson, North Carolina: McFarland & Co. pp. 678–684. ISBN 978-0-89950-917-4. ^ a b Bakker, R. T. 1980. Dinosaur heresy-dinosaur renaissance; pp. 351-462 in R. D. K. Thomas and E. C. Olson (eds. ), A Cold Look at the Warm-blooded Dinosaurs. AAAS Selected Symposia Series No. 28. ^ Lehman, T.M. (1998). "A Gigantic Skull and Skeleton of the Horned Dinosaur Pentaceratops sternbergi from New Mexico". Journal of Paleontology. 72 (5): 894–906. doi:10.1017/s0022336000027220. ^ a b You, Hai-Lu; Tanque, Kyo; Dodson, Peter (2010). "A new species of Archaeoceratops (Dinosauria: Neoceratopsia) from the Early Cretaceous of the Mazongshan area, northwestern China". In Ryan, Michael J.; Chinnery-Allgeier, Brenda J.; Eberth, David A. (eds.). New Perspectives on Horned Dinosaurs: The Royal Tyrrell Museum Ceratopsian Symposium. Bloomington and Indianapolis: Indiana University Press. pp. 59–67. ISBN 978-0-253-35358-0. ^ a b Carpenter, Kenneth; Bartlett, Jeff; Bird, John; Barrick, Reese (2008). "Ankylosaurs from the Price River Quarries, Cedar Mountain Formation (Lower Cretaceous), east-central Utah". Journal of Vertebrate Paleontology. 28 (4): 1089–1101. doi:10.1671/0272-4634-28.4.1089. ^ Carpenter, K. (2004). "Redescription of Ankylosaurus magniventris Brown 1908 (Ankylosauridae) from the Upper Cretaceous of the Western Interior of North America". Canadian Journal of Earth Sciences. 41 (8): 961–986. Bibcode:2004CaJES..41..961C. doi:10.1139/e04-043. ^ a b Arbour. V.M. ; Mallon, J.C. (2017). "Unusual cranial and postcranial anatomy in the archetypal ankylosaur Ankylosaurus magniventris". FACETS. 2 (2): 764–794. doi:10.1139/facets-2017-0063. ^ Carpenter, Kenneth. (1984). "Skeletal reconstruction and life restoration of Sauropelta (Ankylosauria: Nodosauridae) from the Cretaceous of North America". Canadian Journal of Earth Sciences. 21 (12): 1491–1498. Bibcode:1984CaJES..21.1491C. doi:10.1139/e84-154. ^ a b Foster, J.R. (2003). Paleoecological analysis of the vertebrate fauna of the Morrison Formation (Upper Jurassic), Rocky Mountain region, U.S.A. New Mexico Museum of Natural History and Science Bulletin, 23. Albuquerque, New Mexico: New Mexico Museum of Natural History and Science. Wikimedia Commons has media related to Dinosauria size comparisons.